The vast majority of metallic and ceramic objects have a granular microstructure, which has a direct influence on their mechanical behaviour. Understanding the microstructure of these materials is especially important for nuclear reactors and other safety-critical applications in which they are used. Modern mathematical tools and recent developments in computed tomography can be used to study the evolution of these materials when they are being deformed or heated. Viganò, N.R. (2017). 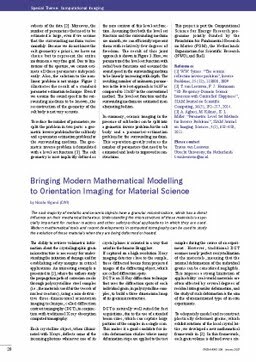 Bringing modern mathematical modeling to orientation imaging for material science. ERCIM News, 108, 28–29.